UMPC maker OQO announced its latest model, the OQO E2 which has HSDPA capability. However, the HSDPA capability of the OQO E2 is only compatible with networks in Europe and Asia as it runs on UMTS/HSDPA 2100 MHz and GPRS/EDGE 900 MHz and 1800 Mhz networks. Because of this, the OQO E2 is not available in the United States. The OQO E2 has a 1.6 GHz VIA C7M processor, VIA VX700 graphics card, 120GB hard disk drive, and 1GB DDR2 memory. A 5 inch widescreen LCD is on this OQO E2 and the device only weighs .5 KG. Connectivity options on the OQO E2 includes integrated Bluetooth, embeded mobile broadband access, and built-in 802.11 a/b/g WLAN. 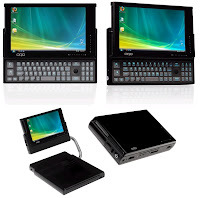 The OQO E2 can run the full version of Windows Vista, making this device the Ultimate Portable PC. The OQO E2 will set you back around 1,172 GBP and is available at Expansys.com and Dynamism.com.